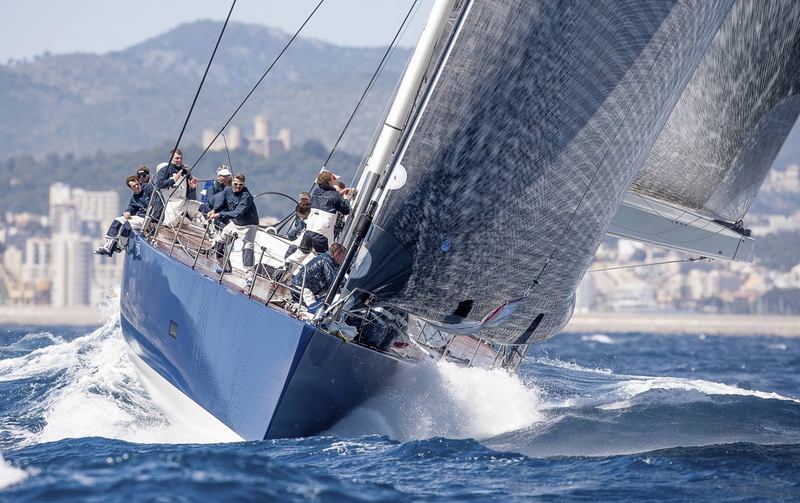 Palma de Mallorca, April 19th 2012 - After the first day of Mapfre Palma Vela Britain's Magic Carpet 2 with Jochen Schumann at the helm and Sir Peter Ogden's Jethou lead the Maxi class and tomorrow the Soto 40, ORC, One Design and Vintage and Classic classes join the rest of the fleet. The heavyweights of the 2012 Mapfre PalmaVela regatta 115 boat fleet showed their muscle on the season's first event today. 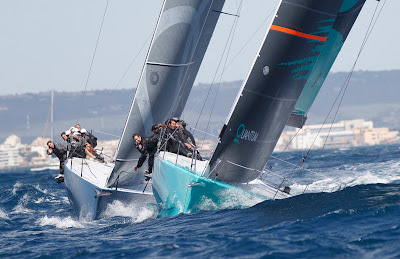 Maxis and Mini Maxis, both racing in compensated time in the Maxi division, were joined on the waters of Palma the TP52 box rule class, which runs in real time. In a nice 20-22 knot westerly wind with gusts reaching 25 knots boosted Jochen Schuemann Skippered Magic Wave and Sir Peter Ogden's Jethou up to the first position in the Maxi class. Both boats are tight in points after the former was second and first and Jethou first and second in today's two races after times were compensated. Dr. Johan Killinger's Emma finished third after two third places, whereas Peter Stas Alpina had to abandon due to a man over board incident which was soon recovered. 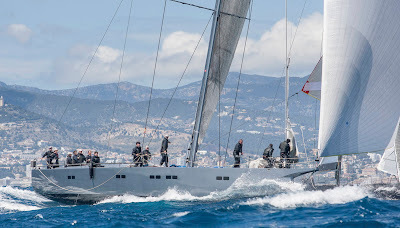 The new build Azzurra designed byArgentinean Alberto Roemmers was the TP52's class’s big news, but the Guillermo Parada's skippered boat was beaten by the two 2011 builds in the four boat fleet: Quantum Racing and RÁN, who racked up a win apiece in today's two races. The Swedish flagged boat, owned and helmed by Niklas Zenstrom, comfortably won race one and finished second in the second, while 32 America's Cup winner Ed Baird skippered Quantum Racing did the other way around, a second place and a first. Audi Azzurra trailed behind and could only manage two third positions, whereas a bad spinnaker drop by Gladiator in the opening race forced Tom Wilson's skippered TP52 to abandon. That, together with a fourth place in the second race, leaves them at the bottom of the scoring board after day one. Tomorrow the rest of the classes will come onto the stage but for Disabled Sailing which will do so on Saturday. The Soto 40's had their practice day today and will start racing tomorrow with three windward-leeward races in the same race area -Delta- as the Maxis and TP 52's. The largest fleets of the 2012 Mapfre PalmaVela regatta, the one of ORC and Vintage and Classic classes will run their coastal race tomorrow in the Alfa area whereas the J80, Dragon and Flying Fifteen will run three races in the Bravo Area.